Ty Hensley presumed last Thursday would be a normal day. Well, as normal a day as the right-hander has had lately. Hensley knew the Rule 5 Draft was that morning, but without an inkling that he'd be taken, the 2012 Yankees first-rounder headed out for his usual 10 a.m. workout, only to return to a cell phone quickly filling up with texts. "I found out like everyone else," he said. "When I started reading all those texts, I kept thinking, 'What?' Then I went downstairs, turned on the TV and thought, 'Oh wow!'" After a shoulder condition knocked down his signing bonus in 2012, followed by hip surgery in 2013 and Tommy John surgery in 2015 and 2016 -- not to mention an assault that grabbed headlines and left him with a broken jaw in early 2015 -- the 23-year-old was selected by the Tampa Bay Rays with the third pick in the Triple-A phase of the Rule 5 Draft. The Minor League phase isn't like its big league cousin. During the latter, eligible players are taken for $100,000 but must be offered back for $50,000 if they don't remain on the 25-man MLB roster for the duration of the following season. The Triple-A portion requires less of a financial and roster commitment. Organizations can select any Rule 5-eligible player not on a Triple-A roster, the pick costs only $24,000 and the player doesn't have to stick to a roster once chosen. 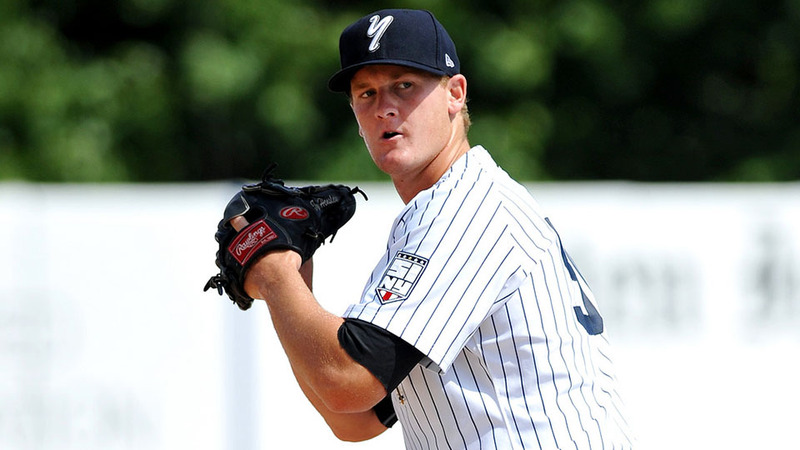 Because of his injury history the Yankees chose not to protect Hensley, who has thrown only 42 2/3 innings in the Minors and none since Aug. 25, 2014 with Class A Short Season Staten Island. The Rays, on the flip side, saw an opportunity to add a former 30th overall pick once lauded for his mid-90s fastball-curve combo and who had been ranked as highly as No. 6 in the Yankees system. "We saw him as an amateur, and like everyone else, we liked what we saw," said Rays director of baseball development Peter Bendix. "We saw him a couple of times in the Minors as well, but beyond that, it's obviously been hard to see what he has. No one knows what he is as a pitcher right now. But we were confident in who he is as a person after checking in on that as much as we could. "There are a lot of things to like. He's still very young. Everyone thinks highly of him as a person. Especially in the Minor League Rule 5 Draft without the stipulations, you jump on those guys when you can." Despite the new opportunity, the Oklahoma native still has a long road in front of him, though it's not quite as long as the one behind him. The Yankees were reportedly ready to sign Hensley to a slot-value $1.6 million bonus back in 2012, but a post-Draft physical showed potential shoulder problems that caused the club to reduce it to $1.2 million. The following season, he required surgery for a hip impingement that knocked him out for all of 2013. He returned to post a 2.93 ERA with 40 strikeouts in 30 2/3 innings between the Gulf Coast and New York-Penn Leagues in 2014. Despite those steps forward, he didn't get on a Minor League mound in 2015 after elbow problems led to Tommy John surgery that April. That would be enough for a lifetime of injuries for a baseball player. Then came this spring. The 6-foot-4, 220-pounder expected to be getting closer to a Minor League mound during Spring Training but couldn't quite get settled in. "Throughout the process, I'd be asking guys that had done it before, 'Is this how it's supposed to feel?'" he said. "There were never really days when things felt really good. It wasn't hurting so much. It just wasn't good, that general feeling." The Yankees planned to stretch Hensley out in extended spring training -- one inning in his first outing, two in his second and three in his third. With each appearance, Hensley could feel his forearm tightening, and his top velocity was sitting in the mid-80s. He lasted only nine pitches in his third start -- eight of which bounced to the plate by his estimation -- before calling over the training staff. A few days later, he visited Dr. James Andrews. "It was pretty easy to see that [the ulnar collateral ligament] was torn again," Hensley said. "The graft never took to the bone apparently. At that point, it wasn't going to work no matter what I did or how I worked." What's followed in the eight months since the surgery has been, in Hensley's eyes, a complete change. He started throwing after six months and recently moved back to 90 feet before the Rays told him he could take an offseason break. ("I've got no problem with that," he said.) He expects to resume the throwing program in January. Hensley wouldn't say he's grateful that his first Tommy John experience prepared him for the second but did admit he's feeling more confident that the elbow issues are behind him for good. "It's definitely not fun going through another year of this stuff," he said. "I don't think anyone would argue that. But if this is what I needed to do to get better and get back, so be it." Of course, the Rays really won't know what they have in Hensley until he gets to Port Charlotte for Spring Training. Tampa Bay international cross-checker Steve Miller worked with Hensley's father, Mike, when they served as assistant coaches at Kansas State and vouched for his character. If Hensley comes as advertised, he could provide a dose of inspiration to younger Rays pitchers, and for Tampa Bay brass, that alone might justify his low Rule 5 cost. "Most players don't go through in 20 years what he's gone through in five," Bendix said. "It would let them slow down or even quit after people tell them to give up. Based on what we found, it seems like it's strengthened his resolve. Obviously there's still a long way to go, but he's got the type of personality we want in this organization." Hensley traces a pretty straight line to his optimism. "I think it comes down to what my parents taught me -- anything worth doing is worth working for, no matter the obstacles," he said. "With the hip surgery, I felt like I was going to have to have it at some point. I was always tight in the hips. But every year I've gotten further from it, I've felt better and feel like a better athlete. The arm surgeries, well, that's the bread and butter, if you're a pitcher. So I've needed my parents and that supporting cast to help me see the bright light at the end of the tunnel." While the bright light for many means the Show, Hensley will take pitching on a Minor League mound as his immediate goal for 2017, and he thinks he'll succeed with the backing of a new organization that believes in him. "I guess I haven't thought that far ahead," he said. "The most important thing is what I'm doing each and every day. That's the one thing you learn when you're going through this process, to take it day by day because there are too many things to think about even that way. Do that and the bigger things will come."